Brian Pierce, a graduate of the United States Coast Guard Academy, was stationed in Maine at Bath Iron Works. While there, he completed his premedical studies at the University of Southern Maine. He then left the Coast Guard to attend Dartmouth Medical School on an Air Force scholarship, graduating in 1995 and then training in family medicine at Andrews Air Force Base, Maryland. In the Air Force, he practiced family medicine at Misawa Air Base, Japan and Dover Air Force Base, Delaware. 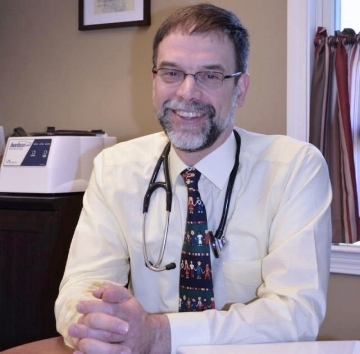 In 2002, Dr. Pierce and his family moved to Camden, Maine, where he joined Midcoast Medicine, an independent family medicine and psychiatry practice. From 2004 to 2014, Dr. Pierce was an owner and managing partner at Midcoast Medicine and is proud to have managed its growth to a multi-specialty practice and medical billing service. During this time, Midcoast Medicine was voted "Best of the Best" Medical Practice for 8 years running in the Knox VillageSoup/Camden Herald readers' poll. In addition to his outpatient family medicine practice, Dr Pierce had been a part-time hospitalist contractor at Penobscot Bay Medicine Center for years and recently helped Groups, a chain of addiction treatment clinics, grow a new clinic in Rockland, Maine. Dr. Pierce was president of our state medical society, the Maine Medical Association, from 2015 to 2016 and chairs their Payment Reform committee. He's also an associate member of the Maine Osteopathic Association. He was a volunteer physician at the Knox County Health Clinic for years and now contributes memberships in this practice for use by the Knox Clinic. Prior to starting this practice, he'd been a volunteer physician over the years with the Good Samaritan Mission Council in La Romana, Dominican Republic and hopes to return to this when not busy growing a new practice here. Dr. Pierce lives in Camden with his wife Andrea. In their spare time, they keep busy with their four adult children. He also enjoys biking, sailing and fly fishing.